One of the most popular PHP books for beginners, this shiny new 4th edition has been completely updated using only best-practice PHP. At around 480 pages, this book is an easy read. As you move through the book youâ€™ll quickly notice that itâ€™s written in a clear tutorial format thatâ€™s easy to understand, and illustrated with plenty of screenshots and diagrams, providing quick visual cues. If you hate wading through dry, academic-style â€œhow toâ€� texts, this book will be a breath of fresh air to you. If youâ€™ve never built a database driven web site and youâ€™re looking to go beyond the limitations of a static site, this book will start you off in no time. 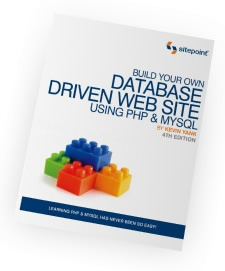 And if you have built database driven web sites before, the extensive PHP/MySQL reference guides included will ensure this book remains an extremely handy desk reference. Check out the free sample chapters or order a copy today.